Could Medical Marijuana Help Ebola Patients? Recent fears about the Ebola outbreak are prompting international investigations and medical probes into potential cures and treatments. 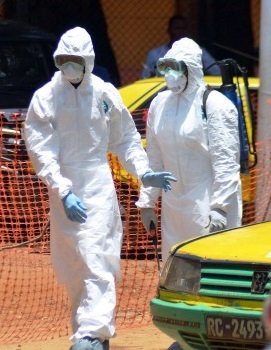 The Ebola virus has erupted in West Africa, already killing over 4,500 people, and causing medical professionals, authorities, and government entities to scramble to contain the virus and to find a cure or vaccine. Among the claims about potential cures for Ebola, is a U.S. governor’s voice, claiming that marijuana has the potential to cure Ebola. According to reports, a medical director and the CEO of America’s largest marijuana companies, made a public statement that cannabis has the potential power to stop the spread of Ebola. Gary Johnson, a former candidate for U.S. President and former governor of New Mexico, argued more research should be performed to determine whether certain cannabis properties could be effective in treating and managing the Ebola outbreak. The drug has formerly been associated with the alleviation of pain and other symptoms related to serious disease, including cancer. It has also been shown to improve the function of the immunity system. Though marijuana is nowhere near being named a cure or treatment of this illness, proponents suggest it’s an option worth exploring. The World Health Organization has predicted the number of Ebola fatalities will continue to rise so long as no vaccine is tested and released. Given the number of researchers seeking effective ways to fight Ebola, it is not surprising that cannabis advocates have also weighed in. The founder of NewCure.org believes cannabis is one way to reduce the number of deaths, and patients could benefit from clinical use. These researchers assert there has already been substantive research done on the drug’s ability to fight other diseases, including Lyme’s disease. Cannabis has also been studied as a potential treatment for the HIV virus, as marijuana has been shown to have immunity-boosting properties. Whether you are a medical marijuana patient or dispensary owner, it is important to understand marijuana law and your rights in California and nationwide. Our Orange County medical marijuana attorneys are abreast of the legal evolution of marijuana law and the worldwide implications for treatment. At the same time, we are also aware of how marijuana laws can interfere with patient rights. If you are under investigation or have been charged with a marijuana crime, we are committed to fighting for you. International research has shown that marijuana has significant potential for medical treatment, though researchers are often restricted by state and federal laws regarding use and testing. Ebola kills by attacking the immune system and medical cannabis advocates believe that the drug could reduce the severity of the virus. At the very least, further testing is warranted.